It was founded in October 2003 and from its first steps the Choir of Naoussa appeared to have quick development. 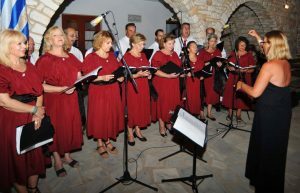 Its aim is to promote the choral song in Paros and other places but also to give people the opportunity to express themselves through song. It is directed by the professor of music Fenia Theofilou. The repertory is varied, mainly traditional. Apart from its clearly choral program, it presents and revives customs and scenes of the place while it also participates in theatrical plays. It is accompanied with live music. 2005: “Cinnamon and Dyosmaraki”: Theatrical play accompanied with choir, presentation in Nicosia, Cyprus. 2006: Istanbul, event or the support of “Zografeio” High school-Lyceum. Presentation the play “Dyosmaraki and Cinnamon” by Ar. 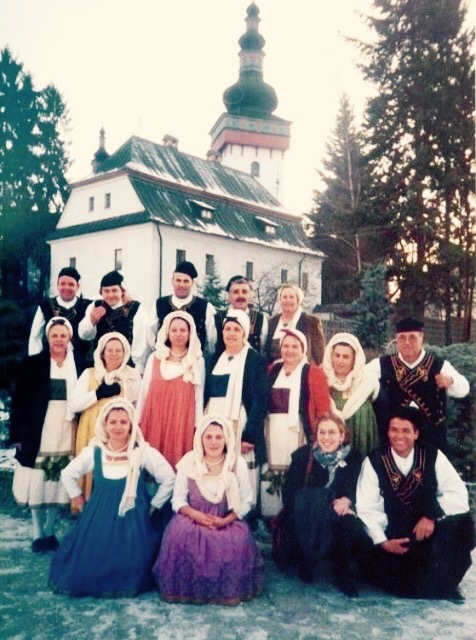 Kontrafouri . 2007: Concerts with Asia Minor’s Songs. 2008: Homage to the singer Vicky Mosholiou. 2009: Concerts with Mikis Theodwrakis Songs. 2010: Homage to the poet Mixalis Ganas with presence of the poet in Paros. 2012: Music-poetry tribute to poet Nikos Gatsos. It was founded in October 2006 and functions under the address of the musician Mrs Konstantina Andreakou. It has presented in adaptation The Flower of Seashore by Alexandros Papadiamantis. It is always accompanied with live music by traditional instruments of the island. 2007: The Children’s Choir of Naoussa took the second prize in the Panellenic Choir Competition in Athens, held by XON.